When we look at the Moon from Earth, we always see the same side. Until Lna 3 sent back photos in 1959, no-one knew what the other side looked like. The Moon is nearly twice as big as the planet Pluto. The "Man in the Moon" isn't always seen as a man. People from India see an old woman with a spinning wheel. People from Mexico see a rabbit! The Moon is not that small compared to the Earth. Sometimes the Earth and Moon together are called a binary or double planet system. The Moon is our nearest neighbour in space. Most of the planets in the Solar System are much bigger than their moons. The Moon is just under 3,500 kilometres (km) wide. This means the Moon is not very small compared to Earth. So the Earth and Moon together are sometimes called a binary or double planet system. The Moon is approximately 238,800 miles from earth. What is the Moon's surface like? 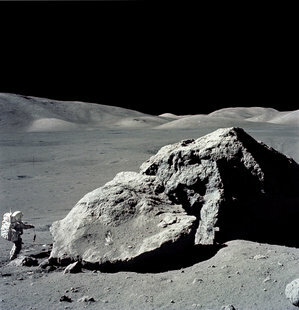 Astronaut Harrison Schmitt collecting rocks from the Moon during the Apollo XVII mission. The Moon does not have any atmosphere. It also doesn't have any liquid water on its surface. During the day it becomes very hot, but at night it is icy cold. A person visiting the Moon needs an air supply and a special suit. The Moon has many craters on its surface. The largest one is called the South Pole-Aitken Basin and is 2,250 km across. That means it's about the same size as the European Union! It is the biggest crater known in the Solar System. We think nearly all the craters on moons or planets were made by huge rocks hitting them a long time ago. They are called impacts. Some of the craters on the Moon look as if they have rays coming out of them. These rays are rocks thrown across the Moon by the impacts that made the craters. Some of the craters around the bottom of the Moon may have ice in them. There are also darker areas called maria (said "MARR-ee-ah"). These are large pools of lava that cooled a long time ago. Most maria are on the side of the Moon we see from Earth. The lighter areas on the Moon are highlands. Although it is thought that the earth and moon have common origins, the density of the earth is 5.52 grams per cubic cm while the density of the moon is 3.34 grams per cubic cm. One early theory was that the moon is a sister world that formed in orbit around Earth as the Earth formed. This theory failed because it could not explain why the moon lacks iron. A second early idea was that the moon formed somewhere else in the solar system where there was little iron, and then was captured into orbit around Earth. This failed when lunar rocks showed the same isotope composition as the Earth. A third early idea was that early Earth spun so fast that it spun off the moon. This idea would produce a moon similar to Earth's mantle, but it failed when analysis of the total angular momentum and energy involved indicated that the present Earth-moon system could not form in this way. The current theory states that when Earth formed 4.5 billion years ago, a Mars-sized planet smashed into it. The impact melted the Earth's mantle––a young and delicate mantle––and the debris from both planets headed off into space. Eventually that debris coalesced into the Moon. The Moon takes just over 27 Earth days to rotate (spin around) once. How long is a year on the Moon? The Moon also takes just over 27 days to orbit (move around) the Earth. This is why we always see the same side of the Moon when we look from the Earth. We call this side the near side. The other side we call the far side. In 1959 a probe sent back pictures of the far side. That was the first time anyone saw what it looked like. The surface of the Moon is made of rocks and dust. It is about 70 km thick on the near side and 100 km thick on the far side. It is thinner under the maria and thicker under the highlands. There may be more maria on the near side because it was easier for lava to flow into craters. We think the Moon has a small core (center) about 300 km across. How much would the Moon's gravity pull on me? The names "Moon" and "month" both come from the ancient Greek name for the Moon, "Mene". There have been other names for the Moon, like "Selene" and "Luna". Selene was the Greek goddess of the Moon. 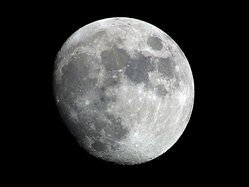 1) How long does it take the Moon to rotate once? 2) How far is the earth from the Moon? 3) What is the density of the Moon? 1. Which statement is not correct about the Moon? c) that a Mars-sized planet smashed into it. 3. TIf an object weights 100 pounds on Earth, what would be its weight on the Moon? 4. If the mass of an object on earth is 100 grams, what would be the mass on the moon? a) huge rocks hitting them a long time ago. They are called impacts.